Struggling with C. diff, care coordination, HAIs, antimicrobial stewardship or Sepsis? 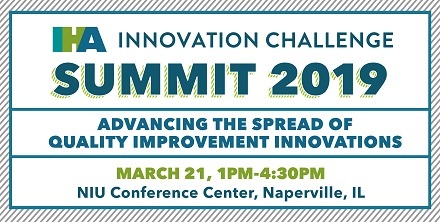 If your answer is yes, then we have some innovative QI projects to introduce you to at our inaugural Innovation Challenge Summit! Last year IHA embarked on an ambitious initiative – galvanizing the spread of high impact, quality improvement innovations across the State of Illinois. Unlike most innovation challenges that focus on identifying new-to-the-world innovations, the Partners in Progress Challenge focuses on innovations that are already showing promise. Knowing that these innovations will have a greater impact on patient outcomes when they are more widely adopted, we partnered three innovative hospital teams with three other Illinois hospitals who wanted to adopt their ideas. Over the course of the last year, there were multiple design sessions in Chicago and Springfield, site visits, and powerful collaboration between the three pairs of hospitals. The first year of the program was amazing, and now we want to scale the application of these innovations even further by inviting you to an interactive event. Our aim with the IHA Innovation Challenge Summit is to leverage the reach of the IHA and the talent of our hospital members to accelerate the spread of high impact innovations to improve the lives of our patients.